This rendition of the Screw Gun by Rudyard Kipling From the 3rd Field Artillery Regiment (The Loyal Company) The poem was first published in the twelfth number of W.E. Henley’s weekly Scots Observer (later to become the National Observer) on 12 July 1890. It was first collected in Departmental Ditties, Barrack Room Ballads and Other Verses, United States Book Company, New York, 1890. The stanzas and refrain can be sung to the tune of the Eton Boating Song, which was written in 1862, the music being composed later by Captain Algernon H Drummond Rifle Brigade (1844-1932), whilst stationed in Lahore in the second half of the 1870s. It is quite possible that Kipling knew the song and he may have had the tune in mind when writing the poem. In any case, the poem is eminently 'singable' to this tune, a quality that made it popular and it eventually became the unofficial song of the Royal Garrison Artillery (RGA), the branch of artillery to which the Mountain Batteries equipped with the screw-guns belonged after 1899. When the Royal Garrison Artillery and Royal Field Artillery were recombined as the Royal Artillery in 1924, it continued in this unofficial role. By the 1950s, it had semi-official status and those attending the Young Officers' Course at the School of Artillery had to learn the words and were rehearsed in singing 'Screw-Guns' to ensure that they would be able to hold their own when it was sung after dinner at regimental dinner-nights, accompanied by a band. These dinner-nights were then a weekly event, now they are much more infrequent. 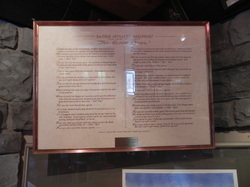 and as some of the references in the poem are to their achievements, the poem can be taken to apply to them all. This scenario features a proposed diorama that will highlight the action in which Captain John Edward de Hart was awarded the Military Cross for gallantry in 1953. While in support of the Royal Netherlands Battalion which had come under a heavy Chinese night attack and had suffered many casualties, including a company commander killed, Captain de Hart “directed artillery fire with outstanding success”, inflicting over 125 casualties and aborting two Chinese raids. The picture on the left depicts the artist's concept for the three dimensional diorama to be located in this corner. It will simulate standing in the OP looking out over the zone of observation. 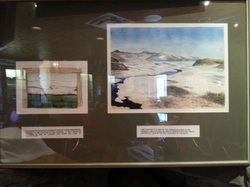 The painting on the right is a view of the terrain in Korea in the general area of Jack de Hart's observation post which apparently was in the hill features to the right. A full description of the award is provided on the Bar page.